Hasselback Potatoes were originally developed in by the Swedish Chef! * The original recipe called for butter, breadcrumbs and almonds.We take a slightly different approach using butter, bacon fat and rosemary! * Hasselbackspotatis was created in 1953 by Leif Elisson from Värmland, who was trainee chef at restaurant Hasselbacken on Djurgården in Stockholm. 1. 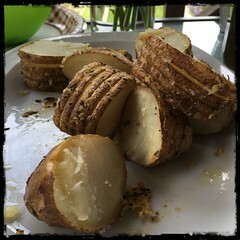 Clean and cut the potatoes in thin slices but do not cut through so the slices stay attached. 2. In a small sauce pan, heat up the crushed garlic with the butter, bacon fat, olive oil, fresh rosemary, (optional hot pepper flakes), salt and pepper. 3. Preheat oven to about 375F, place potatoes in a small baking pan and brush with mixture. 4. Cook for about 45-60 minutes or until the tops are crispy and the flesh is soft.